1. Praise, Praise, Praise! Acknowledge the A in art, the good attendance, the well-mannered attitude. Then focus on areas of improvement. Assure your child that the grade does not make him a failure and that together you can find helpful strategies. 2. Discuss, Don't Lecture! Kids tune out lectures. Instead, ask this question: "What do you think happened, and does this reflect the work you put into it?" Your child will likely point you to the problem and the solution. Does the teacher talk too fast? A recorder could help. Is homework incomplete? A structured routine is vital. Kids need some downtime to recharge before tackling homework. Build homework into a daily routine that includes a protein snack for fuel, some physical play, a half hour of tube time, chatting with friends, and a daily chore like feeding the dog. 3. Identify and acknowledge motivational patterns. Reward - and inspire - by recognizing and building on success and special interests. If your son stumbles in math, a learning-based computer game could make numbers click. 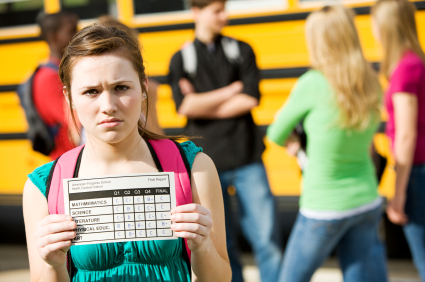 Don't punish poor grades. It's better to restructure time (such as limiting instant messaging) to foster progress. Fear can block learning. Focus on a fresh start. 4. Think proficiency, not perfection. Some kids are C students yet excel at music, art, or athletics. Nurture their gifts but discuss expectations. Rather than striving for straight A's, expect that your child be proficient in academic and social-emotional learning for their grade level that includes lifelong learning skills, such as team membership, problem solving, critical thinking and communication. 5. Meet with the teacher. Learn about the teaching style, rules, how you can help your child, and access to tutoring. The more you learn and communicate, the greater the chances of your child's success. If you think a grade is unfair, call the teacher or counselor and act as your child's advocate. Perhaps your child should be tested for learning, behavioral or other problems.